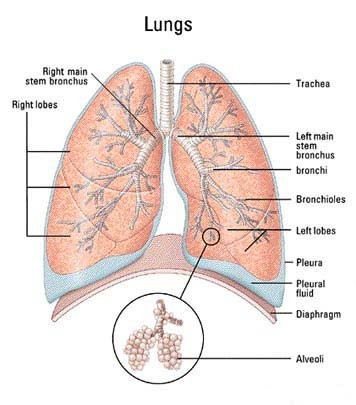 The lungs are a pair of organs located in the chest that performs respiration. Humans have two lungs; the left lung is divided into two lobes and the right lung is divided into three. The lungs are located in the chest cavity inside the rib cage. They are made of elastic, spongy tissue as they stretch out and constricts while you breathe. The trachea and the bronchi are the airways that bring the air to the lungs. They are made of smooth muscle and cartilage, which allows the airways to constrict and expand. The duty of the lungs and the airways is to bring in fresh air, rich in oxygen and as well as to get rid of carbon dioxide waste made by the cells. They also regulate the concentration of hydrogen ions in the blood. The diaphragm and the intercostal muscles, which are the muscles located between the ribs, contract and expand the chest cavity as you inhale. The pressure in the chest cavity below the outside pressure is lowered because of the expansion. Air flows into the airways and inflates the lungs. On the other hand, the diaphragm and intercostal muscles relax and the chest cavity gets smaller when you exhale. The decrease in the volume of the cavity increases the pressure in the chest cavity, air from the lungs then travels out of the airways. This cycle is repeated every time you breathe. The air you breathe goes into the trachea and travels down to the vocal cords in the larynx up to the bronchi. From the bronchi, the air then passes through each lung until it reaches the alveoli. The oxygen concentration in each air sac is high; this causes the oxygen to pass across the alveolar membrane into the pulmonary capillary. The oxygen then binds to the haemoglobin at the beginning of the pulmonary capillary and carbon dioxide is released. Carbon dioxide concentration is high in the pulmonary capillary so carbon dioxide leaves the blood by passing through the alveolar membrane into the air sac. These processes happen in fractions of a second. When the carbon dioxide leaves the alveolus, the oxygen enriched-blood goes back to the heart. There are a number of health conditions that affect the lungs. These conditions may be divided into two categories: conditions that make it hard to breathe and conditions that damage the ability of the lungs to exchange carbon dioxide for oxygen. Some of the most common health conditions that make it hard to breathe are: Asthma, Bronchitis, Emphysema, Apnea and Pneumothorax. The most common health conditions that minimize and prevent gas exchange are: Pulmonary Edema, carbon monoxide poisoning and smoke inhalation. The peak of your lung function is in the late teens and early twenties. In your late twenties, lung function can decline up to about 1 percent every year. If you are a regular smoker, it can decline up to 2 percent every year. People who have been smoking since their teens should consider stopping at around their late twenties or early thirties at the risk of getting lung cancer. Though not all people who smoke acquire lung cancer, they are still the most at risk.